Rosemary Edghill is a pen-name of Eluki Bes Shahar. She was born long enough ago to have seen Classic Trek on its first outing and to remember that she once thought Spock Must Die! to be great literature. Between books and short stories in every genre but the Western (several dozen so far), she’s held the usual selection of odd and part-time writer jobs, including bookstore clerk, secretary, beta tester for computer software, graphic designer, book illustrator, library clerk, and administrative assistant for a non-profit arts organization. She can truthfully state that she once killed vampires for a living, and that without any knowledge of medicine has illustrated half-a-dozen medical textbooks. 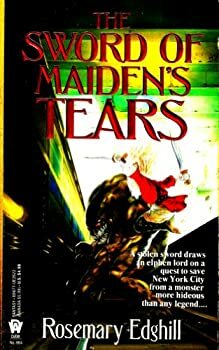 Twelve Treasures — (1994-1997) Publisher: Stumbling across a mugging victim in New York City who turns out to be a being from the world of Elphame, student librarian Ruth Marlowe and her friends learn that the muggers stole a magical sword that changes mortals into grendel-like monsters. 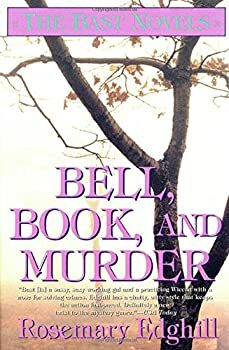 I've become a bit of a Rosemary Edghill fan lately, so I opened the cover of this foray into urban fantasy with anticipation. It takes place in New York in the eighties (take note of the clothing styles for a nostalgic chuckle). Thrust into the teeming streets of New York City is elfin lord Melior — and of course, as an out-of-towner, he gets mugged almost instantly. The mugger steals his magic sword and leaves him bruised and shaken. Melior is taken in by a young grad student, Ruth, and gets to know her and her circle of friends. 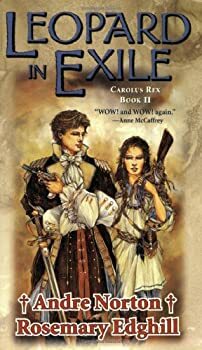 Carolus Rex — (1999-2001) Andre Norton and Rosemary Edghill. Publisher: Young Sarah Cunningham is ripped from the present day and thrust into a volatile alternative Europe of 1805 where King Henry IX rules over the English Empire, America has no revolution, and Napoleon Bonaparte marches unchecked across Europe. I've heard others gripe that this book is basically fluff. Well, yes, it's light, but that's part of what I liked about it. I've read a lot of serious (and sometimes depressing) books lately, and this one was a much-needed cool breeze of just plain fun. The Marchioness of Roxbury, a vain and vapid woman, is on her deathbed, having failed to fulfill a promise made to the Fair Folk. She lives in an alternate England where magic exists, though it's subtle. The only way she can keep her word is by switching places with Sarah Cunningham, her double from our world, an independent woman who was raised in the wilderness and knows her way around a musket. Sarah's memories are jumbled by magic, and now she has to figure out who she is. Is it a bad sign that I just finished Leopard in Exile the night before last, and now I'm hard-pressed to remember much of the plot? 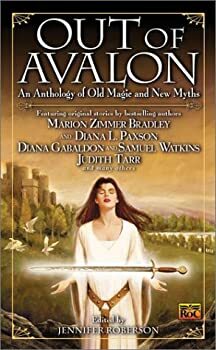 This book's predecessor, Shadow of Albion, was fun in a light sort of way, with the promise of sequels that would delve deeper into the faery magic at which it hints. I should have gotten my first clue about Leopard in Exile when I looked at the cover art. 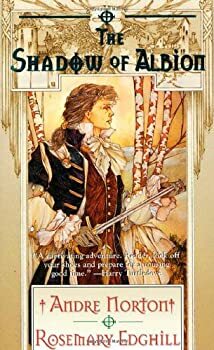 Thomas Canty's drawings are lovely as always, but this illustration looks like it's supposed to be a rough preliminary sketch, compared to the sublime cover of Albion. Even the typefaces are clunkier. But I tried not to judge the book by its cover. Speak Daggers to Her, The Book of Moons, and The Bowl of Night are some of the best fiction about modern witches I've seen yet. And the main reason why is the heroine — Bast. In Bast, Rosemary Edghill creates a delightful heroine with a deep belief in the Goddess and magic — and also with a barbed tongue that deftly skewers the politics and foibles of the Pagan community. Even if there had been no plot in these three novels, I would have kept reading just to "listen" to Bast talk. And as an added bonus, there is a plot. Speak Daggers to Her: An old friend of Bast's dies of seemingly natural causes in her apartment. Bast discovers that her friend had gotten mixed up in a cult — could this be related? 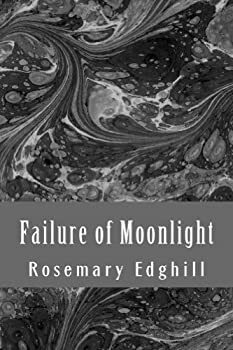 Failure of Moonlight is a collection of three short stories, a novella, and a brief essay starring Bast, the snarky New York Wiccan protagonist of Rosemary Edghill’s BAST mystery series. All four of the fiction pieces have appeared elsewhere, but this is the first time they’ve been published together. Failure of Moonlight is only available currently as an e-book, costs about two dollars as I write this, and is well worth the price. Met by Moonlight — (1998) Publisher: When modern day witch Diana Crossways plunges back to 1647 England, she learns that a mysterious man she saw in Salem, Massachusetts is a notorious witch hunter. He holds the power of life and death over Diana — but she also inflames his desire. Bedlam’s Bard — (2000-2005) Mercedes Lackey and Rosemary Edghill. Publisher: After the events chronicled in Bedlam’s Bard, world-saving bard and magician Eric hopes to settle down to the quiet life. No such luck: his apartment building is a safe-house for a group of occult Guardians protecting New York from supernatural evil. And there’s a new evil for them to guard against… Unethical researchers are planning to raise a psychotropic drug-enslaved army of mercenaries. But this gets the attention of Aerune mac Audelaine, lord of the dark Unseleighe Sidhe, who hopes to use the drugs to break through to the human world. Both plans will bring terror to the world — and both are threatened by the very existence of Eric Banyon. With his possibly loyal companions — a beautiful elven half-breed and a gargoyle — Eric heads for a three-way battle of wizardry that will determine Gotham’s fate-and his own. Shadow Grail — (2010-2014) Mercedes Lackey and Rosemary Edghill. Young adult. Publisher: Spirit White wasn’t exactly a normal teenager; but when a freak accident left her the only survivor in her family, she found herself the legal ward of a strange boarding school and orphanage in the middle of Montana — the Oakhurst Academy — and its even stranger headmaster, Doctor Ambrosius. Arcanum 101: Welcome New Students — (2012) Publisher: Fifteen-year-old Tomas Torres, the son of an immigrant family who are just barely making it, gets picked up by the police for doing some work for the local padrone (collector). For this work, Tomas has made $1000 a week, a lot of money by anyone’s count. But what is the work? What is Tomas arrested for? Arson, but arson that cannot be explained. Tomas has a most unusual gift: he is a fire-starter — he can start fires with sheer force of will that flame from the tips of his fingers. More, he can will fireballs to hurl at his enemies or opponents, and he can incinerate any evidence. But the courts decide they have enough to convict young Tomas and send him off to a school (which Tomas believes to be a kind of jail): St. Rhiannon’s School for the Gifted and Exceptional Student. At St. Rhiannon’s, Tomas soon finds that he is not alone. St. Rhia’s, as they call it, is a school for students of all ages with “gifts” like Tomas’s: students who are pre-cogs, storm-callers, witches, healers, wizards, techno-shamans, psionics, firestarters, teleporters, psychics, sensitives and much, much more. Things he could never have imagined happen at St. Rhia’s, and in time Tomas comes to feel less alone. He begins to believe in what he actually sees (astral warriors, for example) and all that he is taught by his attractive young mentor, VeeVee. All students at St. Rhia’s are attempting to learn to control their gifts. Tomas, too, must learn about the ethics and the laws of magic (of which he knows nothing) and more, how to control the strength and force of his fire. Join Tomas and his friends as they journey through St. Rhia’s and beyond, both through the outside world and through magical Gates to the magical worlds of Chaos and other kingdoms where their gifts will be tested. If they succeed, their powers will take on new relevance and meaning. Dead Reckoning — (2012) Publisher: Jett is a girl disguised as a boy, living as a gambler in the old West as she searches for her long-lost brother. Honoria Gibbons is a smart, self-sufficient young woman who also happens to be a fabulous inventor. Both young women travel the prairie alone — until they are brought together by a zombie invasion! As Jett and Honoria investigate, they soon learn that these zombies aren’t rising from the dead of their own accord … but who would want an undead army? And why? This gunslinging, hair-raising, zombie western mashup is perfect for fans of Cowboys vs. Aliens and Pride & Prejudice & Zombies.